Sixteen seminarians at St. Charles Borromeo Seminary in the Second Theology class and 15 candidates from the School of Diaconate Formation came together on Saturday, May 7, at the seminary’s St. Martin’s Chapel for Mass and to be accepted into the Ministry of Acolyte, with Bishop of Trenton David M. O’Connell, C.M., presiding. Of the seminarians, six are studying for the priesthood for the Philadelphia Archdiocese, nine for other dioceses and one for a religious congregation. All candidates in the School for Diaconate Studies (SDF) are studying for Archdiocese of Philadelphia. For the seminarians this will be the step before ordination to the transitional diaconate next year with priestly ordination in 2018. For the SDF candidates this is the final step before their ordination to the permanent diaconate next year. 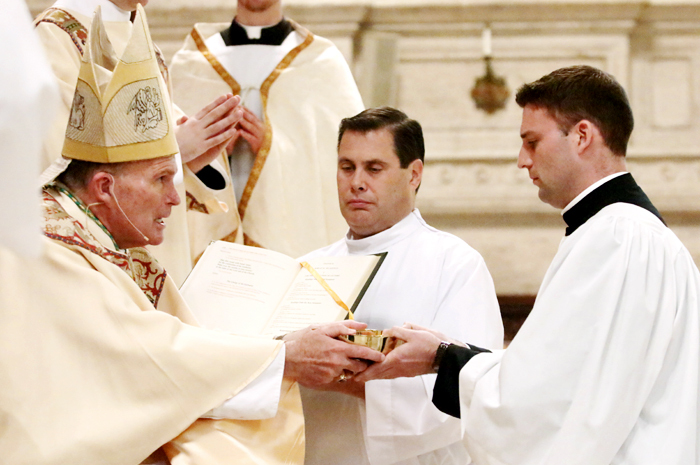 No permanent deacons will be ordained for the archdiocese this year. The Ministry of Acolyte was created after Vatican Council II when Pope Paul VI abolished what was known as the minor orders. The acolyte in effect replaced the former order of subdeacon. An acolyte is appointed to aid the deacon and the priest in liturgical celebrations, especially in the celebration of Mass. He also distributes Communion as an extraordinary minister of the Eucharist. Last year the men received the Ministry of Lector, the other ministry created when minor orders were eliminated. “We are pleased to have a good group of Catholic men who want to serve the church,” said Father Patrick Brady, the dean of the School of Diaconate Formation at St. Charles. 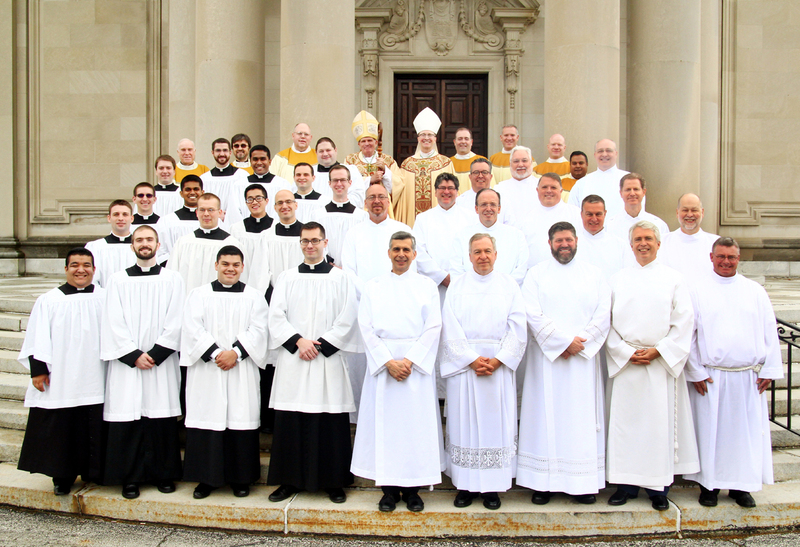 Most prior years the two groups — those preparing for the priesthood and those preparing for the permanent diaconate — had separate liturgies for their reception of the Ministry of Acolyte, but “it is the same ministry they are being called to,” Father Brady said. The number of acolytes from the permanent diaconate program this year is somewhat larger than usual. The reason there will be no permanent deacon ordinations this year is because of a reorganization in the program that caused a year to be skipped. With that said, the numbers are always healthy, and “we usually have 10 to 12 a year,” Father Brady said. “The process is so full of grace,” said Christopher Roberts of Our Mother of Consolation Parish, Philadelphia, who is on the path to the permanent diaconate. “My classmates are my brothers. They are wonderful men, making many sacrifices for the Lord. It is a privilege to be alongside them. Wonderful article. If a seminarian completes all “training” but they choose not to be ordained, do they keep the Ministry of Acolyte or Ministry of Lector or even the title Deacon? Thank you. Someone told me that a married, permanent deacon has received all 7 sacraments. Does he receive Holy Orders or is that just for priests? I noted in your article that you indicate acolytes are ordinary ministers of holy communion. My understanding is that acolytes are still extra-ordinary ministers of holy communion. An important distinction.